The Bartlett School of Architecture has launched a new publication series dedicated to design research produced by its own staff. The series is an online resource showcasing original and experimental works by established and early career design researchers in the School. The folios present a great range of subjects and approaches to architectural research. Each folio focuses on a single project, offering an in-depth visual and textual description of its research questions, methods and outcomes. The result is an illuminating series that highlights the creative role of design practice in architectural research. The series reflects the School’s overall outstanding research production and environment. 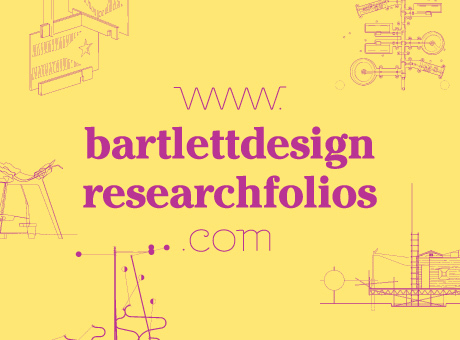 Each folio contributed to our top-rated performance in the latest national research assessment (REF2014) which confirmed the Bartlett’s position as a world-leader in built environment research. Authors include: Laura Allen, Alisa Andrasek, Peter Bishop, Matthew Butcher, Izaskun Chinchilla, Marjan Colletti, Marcos Cruz, Colin Fournier, Murray Fraser, Stephen Gage, Penelope Haralambidou, Christine Hawley, Dirk Krolikowski, CJ Lim, Yeoryia Manolopoulou, Níall McLaughlin, Josep Miàs, James O’Leary, Bob Sheil, Mark Smout, and Patrick Weber.